Sometimes fun wins hearts more than a serious attempt at the things. It is true also for the naming of sports teams. A bowling team name that tickles our senses gives us some light moments. It may be that even a good bowling team has a funny name just to stand out and look different. Bowling is a competitive sport. But people play this sport mostly to enjoy as the game itself is entertaining. The environment around this game is funny and entertaining. If you are forming a college or school bowling team, its name matters a lot. In case you are a professional team, which is committed to winning the competition, then a serious bowling team names are the right choice. If your team is just for adding some fun to the competition, choose from funny bowling team names. Such a name will also go well with your sports logo, which will be the face of your funny team. So, to help you pick funny bowling team names, here is our unique list of names. You can choose any name from the list. Looking For A Custom Bowling T-Shirt? Designhill helps you get custom bowling t-shirts. You can create your own bowling shirts using our T-shirt Maker tool. Use your favorite images or bowling team name and create a custom bowling t shirt. You can also hire a freelance designer to get your custom bowling t-shirt. Want Custom Bowling Team Jerseys? With Designhill’s Artificial Intelligence powered t-shirt and jersey design tool you can create custom bowling jerseys for your bowling team. You can choose the different icons suggested by the tool. Else, you can design your custom bowling jersey with your team name. When you choose a bowling team name, you should also think of creating a team logo that should ideally have the team name on it. Using Designhill’s Logo Maker tool you can create your own bowling team logo. You can also hire a designer on Designhill to get your games or sports logo designed. Go, Name Your Team Now! 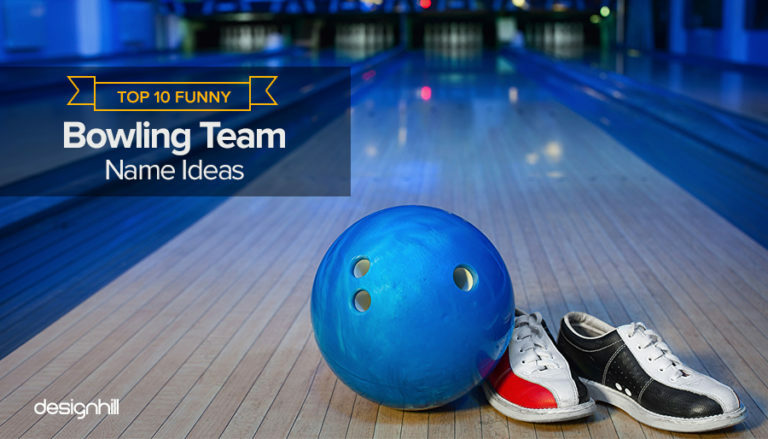 Now that you have got all the funny bowling team name ideas, go name your team. Design a logo for your bowling team. Get team jerseys designed. We have already told you how. You can also get a lot of custom bowling gear like custom caps, custom sweatshirts/hoodies, etc. So, go and select a name first. You have a lot of things to do now.